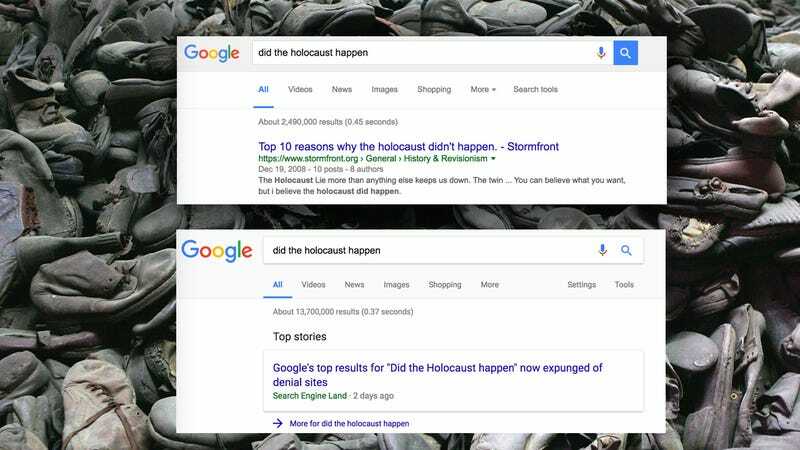 After it was widely reported that the first Google search result for “Did the Holocaust happen?” was from Stormfront, a white supremacist website, Google decided to alter its algorithm to remove Holocaust denial sites all together. An important part of our values as a company is that we don’t edit the search results. What our algorithms produce, whether we like it or not, are the search results. I think people want to know we have unbiased search results. We’ve reached out to Google to ask more about the company’s decision to alter its algorithm, and what that means for the future of fake news. Maybe Google could lend some of its Silicon Valley peers a helping hand with all that. Now when you search “did the Holocaust happen?” Stormfront appears to have disappeared entirely. The company has also corrected the results to “are Jews evil?”—when you search a variety of suggestively hateful questions, it mostly directs to news about the search results scandal. When you search “are Muslims evil?” there isn’t anything Islamophobic until the fourth result. Baby steps. However, when you google “are black people inferior?” the first result is still racist. “We’ll continue to change our algorithms over time in order to tackle these challenges,” the Google spokesperson said.